There are many options available when considering your new garage door installation. The trained garage door specialists at GarageWorks will help you find you the right door (overhead garage door, etc.) to fit your style and your budget. Our expert installers will provide all the advice you need about brands, which material to choose for your door, whether to go insulated or non-insulation, spring design, safety considerations, aesthetics, and all other features to consider when it comes to smooth operation and appearance. There are a wide variety of options when it comes to choosing the right garage door for your home. All these decisions and factors can be answered before you purchase your next door. Our experienced technicians can help ensure that you choose the perfect garage door to tailor fitted to your needs. Selecting a garage door with windows can have many advantages. 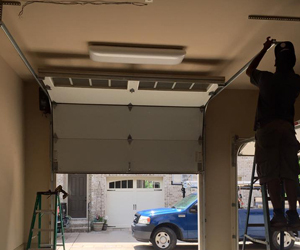 It can add much needed light to your garage during the day. It can also change the appearance of your house in a positive way. Garage door windows are an inexpensive home improvement project with lasting results. Windows come in a wide variety of decorative insert options. When choosing the type of inserts for your home, its best to look at your house from a distance and check out the way your homes trim and windows are shaped. Some examples are a half circle shape, some may be square, others may have vertical grooves, etc. Identifying what is present on your house will better help you choose the design you want to go with on your new door. Insulation added to the windows can differ, but the overall performance of R-value through insulated windows make little difference. Glass unfortunately is the worst insulator. It can be insulated at a small cost, but depending on your needs you may choose to spend the money elsewhere on your door. Would I benefit from insulation? If you have an insulated garage you should upgrade to a insulated garage door. Garage doors can have several types of insulation. As a reference, if you have insulated walls in your garage they will typically be at an r-value of 13. The most economical and widely used insulated doors are the vinyl back models. Most vinyl back doors will come with an r-value of 6.5. Doors with vinyl back insulation will come with polystyrene foam in the middle, around 1 5/16″ thick, with a smooth, white, vinyl back cover. The insulation will add stability to the door and create a cleaner look on the inside. One of the downsides to having the vinyl back door is that it can easily be punctured. So if you have a big dog or kids, you may want to think about upgrading to a steel back door. Steel back doors can range from a 6.3 r value up to a 20 r value and Ranging in thicknesses from 1 5/16″ to 3 1/2″. Steel back doors have two different options for the type of material in each panel; Polystyrene and polyurethane. Polystyrene insulated steel back panels provide an r value of 6.3 for the 1 5/16″ thick models, and 9.0 for the 2″ thick models. The most commonly bought steel back door in the industry is the 2″ thick door with an r value of 9.0. This is sufficient enough to insulate your garage, as long as the walls themselves are insulated. Polyurethane insulated steel back panels provide an r value of 12.9 for the 1 5/16″ thick models, and 18.2 for the 2″ thick models. These models take an extra week to come in, but are the stoutest doors made in the industry. Either steel back option you choose will provide enough insulation to provide a definite temperature change inside your garage. Both options come with a lifetime limited warranty on the doors themselves. These doors are durable and can withstand the wear and tear of dogs and kids. Not to mention they can also take a beating from high winds, are quieter than one and two layer doors, and provide a “solid wall” feel to your garage space. Our garage door color options include a wide variety of choices, we match the option closest to your homes current trim color. White, sandstone, almond, and desert tan are the standard trim colors on 95% of homes being built. These colors are available in ALL option doors. The steel back premium model door is offered in a few other choices like hunter green, gray, black, bronze, and chocolate brown. As well as wood stain options, dark, cherry, and walnut. There are many different factors that come into play when choosing the right garage door for your home. We hope that this will give you a better idea and vision to what your garage door opening can be. Single-layer steel non-insulated construction in an attractive, affordable and reliable garage door. Traditional raised short and long panels and flush contemporary design options.